Right now, 35 states have a law on their books that bans drivers from texting while operating a vehicle. During a 60 day special legislative session being held in in Tallahassee starting next month, Florida will try to make it 36. The proposed law would make driving while texting a secondary offense meaning that the police could not pull over a driver who is texting without the person committing some other offense like speeding, reckless driving, etc. If the person driving a vehicle is involved in a crash and the police feel that the evidence shows that the driver was texting while in control of the vehicle, a citation could be issued. The proposed law is sponsored by State Sen. Nancy Detert, a Republican who represents Venice. Past attempts to push a similar law through the legislature have failed due to State Republicans who consider such a ban to be an attack on personal liberty. Nonetheless, Detert, who twice before has tried to push this bill through to completion, says that her belief in small government is overridden by her desire for personal safety. Last year, Sen. Ellyn Bogdanoff (R-Fort Lauderdale) blocked a texting ban from being voted on in her House Committee, which killed the bill. The bill under consideration would allow drivers to text at a red light and use GPS features, dial and make a call while driving. Sending email or an IM would be out. First time violators would be charged $30 for breaking the ban. A second violation that occurs within 5 years of the first one would result in a $60 fine and 3 points on the driver's record. If the violation resulted in a crash, 6 points would be put on the driver's record. Sen. Arthenia Joyner (D-Tampa) said that Florida needs to catch up with the rest of the nation "because texting is addictive." Last week,a national survey showed that 50% of drivers age 21-24 text while driving which resulted in a call by U.S. Secretary of Transportation Ray LaHood for Congress to impose a national ban on texting while driving. While 95% of those asked by AAA believe that drivers should not send texts or email while operating a vehicle, the truth is that in the 35 states that already enforce a ban on the activity, traffic safety showed no improvement. Oh great. They can have a million drivers who learned to drive on a model-T, but instead they are making laws about texting? How about a law that you have to be able to tell the difference between the accelerator and brake pedals. 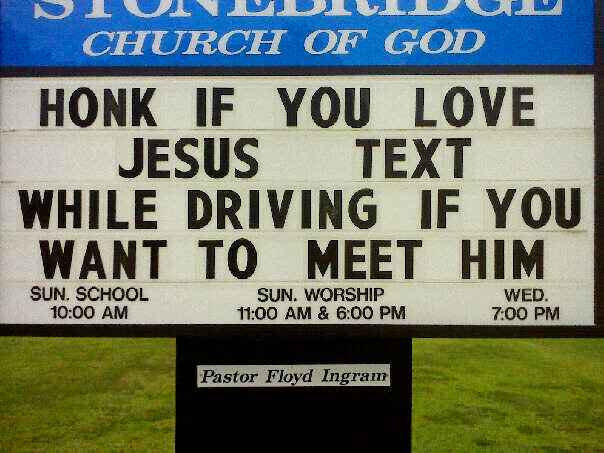 They should ban the texting & driving. I would hate to be in an accident with someone who is texting. I would be so pist off. I appreciate the thought guys, but how are they really going to find out who's texting and driving unless they're one of those people that text with the phone on top of the wheel (which looks ridiculous btw). 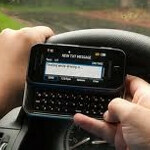 If a cop suspects someone of driving while intexticated he can ask to see the phone and look at the times of text. Seems reasonable. Great another law. Living in Florida here. Yes texting and driving is the dumbest thing someone could do but we don't need another law. Stop making government bigger guys and use common sense. Well that is just a brilliant observation... If I'm stupid enough to risk YOUR life by texting and driving, then what makes you think I have any common sense? Driving everyday on the road is dangerous. But the idea that government can stop driving being dangerous by implementing more laws rather than people actually teaching their kids common sense. I don't need more government intervention. Now, I knew a lot of people were stupid, but who is seriously stupid enough to text while driving, granted, with Siri's message dictating thing you can keep your eyes on the road but still, bout a year ago some woman was texting on her BB and wrote off 3 cars, mine included. i'm down with this law. make it illegal to eat and drive or read and drive or do make up and drive. why is it so exclusive for "hands" free for cell phones but not other stupid actions?! OMG! Here is the frozen north Minnesota, this law went into effect last summer. I still see a lot of people doing it.